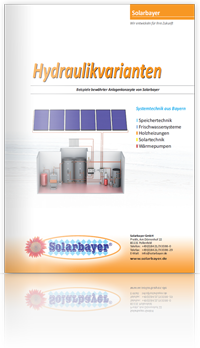 All system components from Solarbayer, including a wood gasifying boiler, stratification buffer tanks, solar DHW tank and a thermal solar system with flat plate collectors. You will find several drawings of installation examples for wood log boilers, oil/gas boilers, as well as solar systems and heat pumps in combination with our high efficient storage buffer tanks. We offer you inforamtion on heat loading, supplementary heat or return flow increase as well as on hydraulic switches as a planning aid for your heating system.